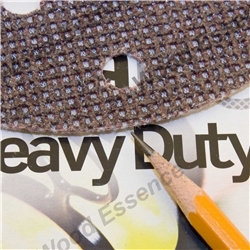 Highly Aggressive, Speciality Aluminum Oxide abrasive for tough applications. 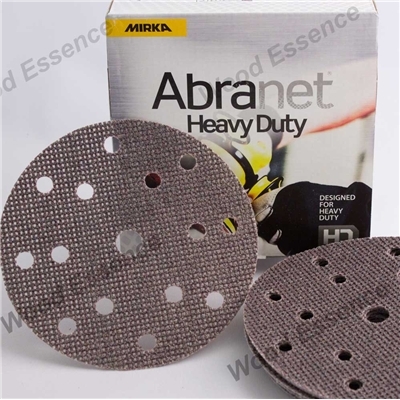 Crossed Grid of Abrasive clears dust for non-clog operation and rapid stock removal. Mesh back allows superior dust collection right through mesh. Tough & Durable make these perfect for stripping and rough shaping applications in cabinetry, railing and flooring applications. 6" dia x 15 Hole Pattern fits Mirka and other popular sanders such as Festool. 5" dia x 17 Hole Pattern fits 8 Hole and other styles of backup pads. Highly Aggressive Cutting Abranet HD discs have been dubbed "the Annihilators" by one of our regular customers! Nothing beats these for stripping and rough shaping of floors, doors, furniture and more!